In the previous Conversation A GLOBAL COMMUNITY OF AWESOMENESS I brought attention to THE PATTERN OF ETERNITY UPDATE (Newsletter). IN LIGHT of this I would like to expand more fully and to …. SHINE THE SPOTLIGHT on the purpose of the Updates and what they offer enabling you to feel if The Pattern Of Eternity resonates with …. If you are someone that has ever felt this way …. PRECIOUS RECOLLECTIONS OF THE AUTHENTIC YOU. Why did you not know this ? You did …. that is exactly what you felt …. your connection to …. YOUR PERSONAL INNER KNOWING your INTUITION ! For aeons our world and the truth of who we are within it has been distorted and misconstrued. But don’t despair the essence of the NEW ERA supports you to …. RECLAIM YOUR TRUE IDENTITY ! IT IS WHY YOU CHOSE TO BE HERE AT THIS CRUCIAL EVOLUTIONARY TIME. Reading the above may have stirred more feelings of recognition some would say a feeling of coming home others a feeling of inner joy I refer to it as feeling PINK TICKLED …. WHEN YOU TOUCH IT YOU KNOW YOU ARE IN THE PRESENCE OF MAGIC ! If you are feeling a resonance as you read you will have felt this with other content of the website particularly the Conversation postings, confirmation of your keen sense of awareness and connection to your INDIVIDUALITY. 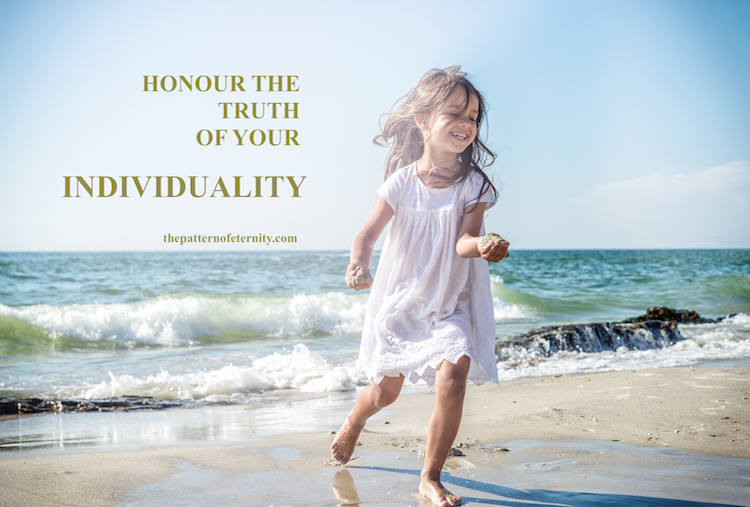 WHEN YOU HONOUR THE TRUTH OF YOUR INDIVIDUALITY EVERY ASPECT OF YOUR LIFE BECOMES THE MEANINGFUL ADVENTURE IT WAS INTENDED TO BE. There is much to uncover to the truth of who you are when you choose to EMPOWER AND RECLAIM YOUR INDIVIDUAL IDENTITY. THE PATTERN OF ETERNITY UPDATE is an opportunity of choice to expand on your depth of understanding. The UPDATES provide support and development if you have ever questioned the validity of your personal identity or simply question your purpose in life. The UPDATES are an opportunity to go deeper in understanding the connection to your inner guidance, that feeling of inner excitement and knowing …. the PINK TICKLE ! The UPDATES are an opportunity to understand why you feel this way and will provide answers to questions you may not yet have realised you were ready to ask. The UPDATES will offer simple tools and techniques to work hand in hand with your already Innate Wisdom and Intuition to a deeper understanding of your INDIVIDUAL IDENTITY. IF YOU FEEL A JOYFUL ANTICIPATION IN THIS MOMENT YOU HAVE JUST BEEN PINK TICKLED ! I would like to suggest you read this Conversation not with the intellect but with the HEART …… this way you cannot mistake resonance …. YOU WILL FEEL IT !